In the Davis Mountains of West Texas lies a small town that evokes equal parts frontier days and space age. A trip to Fort Davis proves well worth every mile it takes many of us to get there. and its namesake fort in the distance below. I planned my route and set out on the 3.5-mile footpath connecting the state park to the national historic site. in the Southwest. The soldiers stationed at the fort, established in 1854 to protect travelers on the San Antonio-El Paso road, spent much of their time building the fort and patrolling for warring bands of Comanches and Apaches. The re-created barracks and fully furnished officer’s quarters made it easy to imagine the grounds bustling with uniformed soldiers. 11:30 a.m. In town, I visited the historic Jeff Davis County Courthouse and popped into the quaint lobby of The Hotel Limpia. I then received a lesson on 1800s broom-making techniques from expert Ron Cox of Davis Mountains Broom Shop and picked up a bag of candied pecans from the Davis Mountains Nut Company. 12:30 p.m. I headed to Stone Village Market, which offers an unexpected oasis of all-natural and organic groceries, along with one of the best sandwiches west of the Colorado River. I ordered a beef pastrami on rye and savored every bite on the outdoor patio. 2:00 p.m. I made my way into the mountains to visit McDonald Observatory, one of the top astronomy research facilities in the world. At this time of day, the only visible star was the sun, which we observed through live telescope images, defying mama’s old rule to “never stare at the sun.” Next we hopped on a shuttle and visited the Observatory’s iconic domes, which house telescopes in use every clear night by scientists all over the world. As awesome as it was in the sunlight, the Observatory saves its best show for night, which was still a few hours away. 5:30 p.m. Before the stars came out, I drove to the Fort Davis Drug Store. Once a full-fledged pharmacy, nowadays this business is best at curing Texas-size appetites. I ordered a 12-ounce “Cowboy’s Rib Eye,” which arrived with the perfect amounts of char and seasoning. Of course, I had to wash it down with an old-fashioned chocolate malt from the soda fountain. 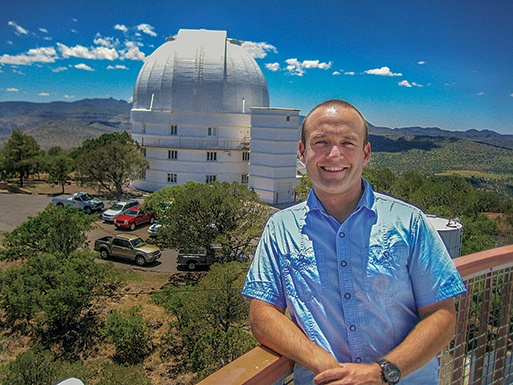 7:00 p.m. Back at the McDonald Observatory, I joined dozens of other amateur astronomers for a nighttime “Star Party.” I found a seat at the outdoor amphitheater and peered up in awe as I listened to the experts explain the vast canopy of stars unfurling before my eyes. I then made my way among a half-dozen telescopes and observed planets, nebulae, and star clusters with amazing clarity. I suddenly felt so small in our infinitely huge universe, which I realized was likely the same sensation the Fort Davis soldiers felt 150 years ago when they stared up into that same Texas sky. Only in Fort Davis do the past, present, and future meld into such an incredible, profound, and delicious adventure. So whether you follow my footsteps or forge your own path, I hope to see you on the road. Contact the Fort Davis Chamber of Commerce, 800/524-3015; www.fortdavis.com. Chet Garner is the host of The Daytripper® travel show on PBS; www.the daytripper.com.